Despite, or perhaps because of Toronto's limelight in the formation of Canadian country, Alberta in the late 1960s was a bustling proving ground for young, talented groups. Although considered by the powers in the east to be more of "Country Little League," groups took what was coming from the US and across Canada. But instead of following the same play book, they were experimenting with new takes on the traditional standards. 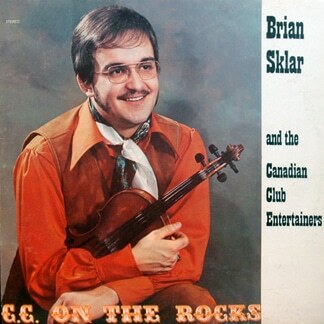 Brian Sklar moved to Edmonton from Prince Albert, Sask in 1969, and played fiddle and drums with various bands on the local area circuit, and appearing on the eponymous debut with the Western Senators in the spring of 1970. By that August, two fellow Saskatchewan boys, Dennis Landry (also from PA) and Regina's Don Dueck, had moved to Edmonton as well. With Landry handling guitars and Dueck playing bass, they continued making their rounds down the roads and back again, developing a loyal following for their entertaining live shows, which were often highlighted with humours banters with the crowd and impromptu solos. By spring of '71, they'd secured the money to go into the studios, and added Montreal native Billy Young as a second guitarist and fiddlist to the team. 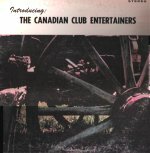 Two weeks later, they were in Korl Sound Studios in Edmonton with owner/producer Mike Kozak, and released their debut album, INTRODUCING THE CANADIAN CLUB ENTERTAINERS on the independent Centurian Records before the summer. Sklar sang on side one, a collection of hits on the country charts at the time and in some cases what would prove to be classics, including Kris Kristofferson's "Me and Bobby McGee," "Okee From Muskokee" and "The Race Is On." Side two featured Young handling the vocals, doing "White Lightnin'," a twangy "ukrainian Medley, "He'll Have To Go" and three more. Noting the entire recording process lasted only around three hours, Sklar reflected on the whole ordeal. "It was done on a two-track recorder, straight off the floor using a spring reverb," he said. Despite what he termed the "garage band quality of the recording," the records were sold off stage at the band's bar gigs - about 500 in the first two weeks. "In those days, it was a novelty to have an album, and they sold for four dollars each. Our wholesale was about a buck, so it was a pretty good source of income. The cover was one of the stock designs available from the reproduction company. A band photo would have been too expensive. After all, we were making about 400 bucks a week for the four of us," Sklar said. Less than a year went by when the band took a break from a hectic touring schedule that had now expanded from BC to Ontario, and returned to Korl Sound. Adding Beau Davis on drums freed up Sklar to contribute more fiddle on the record, which was again done in only a few hours. By this time, Young was gone and replaced by Rick Stevenson. Freddie Pelletier and Doug Aman were brought in for the sessions on guitars and steel guitar respectively. Like the first album, CC ON THE ROCKS was basically raw, off the floor recordings of the band's most requested songs at their shows - traditional country with little studio finesse. Waylon's "Good Hearted Woman," "Diggy Diggy Lo," "Kiss An Angel Good Morning," and a new version of "Maple Sugar" were indicative of the record, what history would deem to be country standards, though still fresh on the airwaves at the time. The band also showed some dexterity and versatility by adding their rendition of Bobby Bloom's "Montego Bay" to their repetoire and including it on the album. Again, the album sold well at their shows, and even gained some airplay in pockets across the country. "We would stop at the radio station in every town we played in or passed through, dropping off play copies and doing interviews, when permitted. We were playing bars and sharing the stage with Go-Go dancers. In fact, in a lot of the Northern Ontario bars, we were required to play live music while the girls danced. Good thing we were drunk most of the time, or we might not have survived," Sklar joked. But by mid '72, Sklar left the group to pursue other avenues, effectively ending their run. After doing a solo album and bringing his fiddle to other artists' records and stages over the next couple of years, he formed Prairie Fire Band. Before long his new group was touring the country, when they landed the gig as the house band on the new CTV comedy series "Funny Farm" in '74. Essentially Canada's answer to "Hee Haw," and hosted by Blake Emmons, it featured comedy sketches and country music acts popular of the day. After three seasons the show ran its course, and Sklar and company picked up where they'd left off, touring coast to coast and into the US, releasing four records over the next decade. At the same time, he found time for other projects, including his spin-off group Captain Canada. He also made his mark as one of the industry's most sought-after studio players, in country as well as western swing and traditional polka circles, working with the likes of Faron Young, Frankie Yankovic, touring with practically everyone in the business throughout North America, including numerous stops at the Grand Ol' Opry and throughout Europe. He reformed The Western Senators on and off again over the years (with son Aaron occasionally sitting behind the drumkit),and in the late '00s, he formed his new project, The Tex Pistols. By the end of the decade, he began dabblling in federal politics, running as the NDP candidate for Regina Lumsden Lake Centre.